As meaningless as the words “red velvet” as a flavor might be if you’re not American, I was very intrigued by it. Red velvet. Doesn’t that sound luscious, calling to mind imagery of rich, sensuous, luxury? 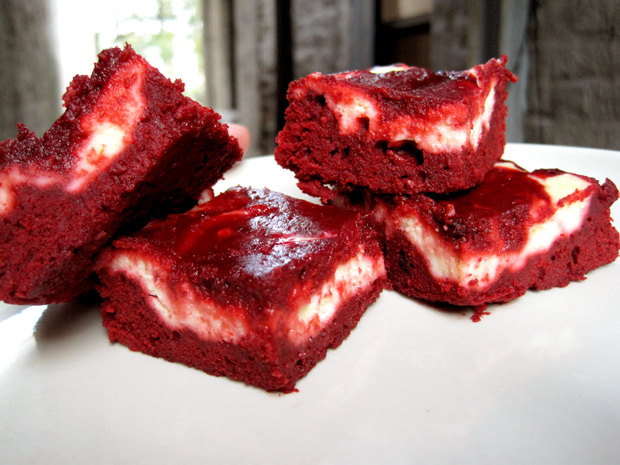 And red velvet desserts are often visually very striking as well. (Unless you make an albino red velvet cake, like I did.) I know it’s all food coloring, but for me, the best part of a red velvet cake is its cream cheese frosting. What really got me into baking was cheesecake. 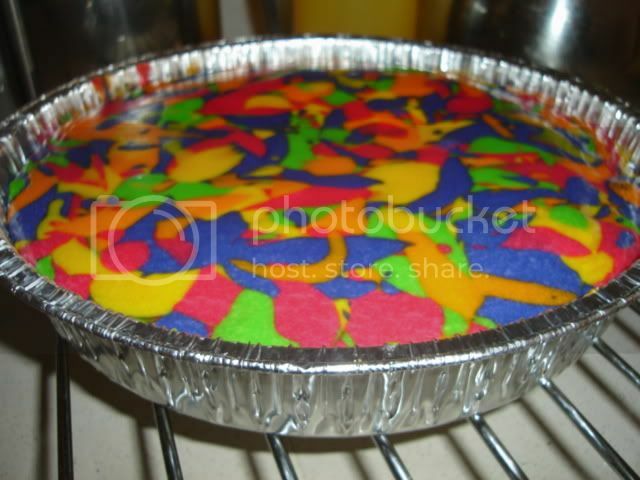 I think my first ever successful baking experiment was a rainbow cheesecake, which you can view here. Since then, cream cheese and I have had a great affinity for each other. 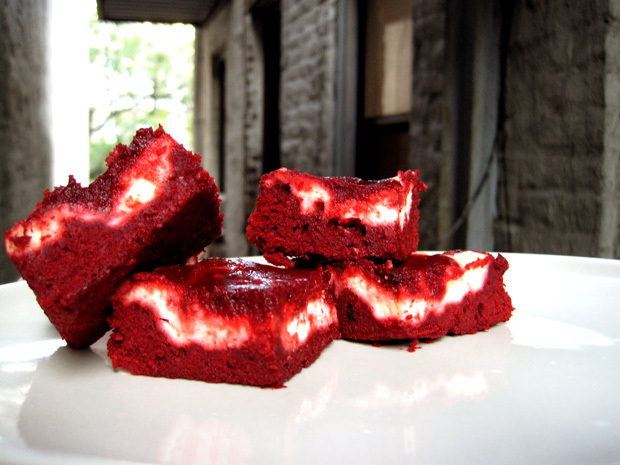 What better way to maximize the cheesecake effect than to incarnate red velvet in a red velvet cheesecake brownie form? This recipe is very easy to follow. Texture-wise, it’s not quite as fudgey as I’d like, but I wouldn’t call it cakey either. It falls squarely in the middle of the two, but gets fudgier if you chill the brownies before eating. I also have a pretty hard time getting the cheesecake layer to marble nicely, but I think that’s because I put too much of the brownie layer on top. I think the trick is to reserve less of the batter than you think you might need. Butter an 8 by 8-inch baking pan or line it with parchment/aluminum foil, and set aside. Brownie layer: In a saucepan on medium heat melt the butter. Remove the butter to a large bowl and add the sugar, vanilla, cocoa powder, salt, food coloring, and vinegar, in that order, mixing between additions. Whisk the eggs in a small bowl and stir it into the cocoa mix. Fold in the flour until lightly combined. Stir in the walnuts and pour the batter into the prepared baking pan, saving 1/4 cup of the batter for the top.